A giant azhdarchid compared to a giraffe. Illustration by Mark Witton/University of Portsmouth. Pterosaurs are flying reptiles that lived between about 230 and 65 million years ago. Although often called dinosaurs, they are actually a distinct branch of reptiles that independently evolved flight. There have been about 100 species of pterosaurs discovered so far, and one group of about a dozen species—the azhdarchids—is of particular interest. In 1971, a student from the University of Texas working at Big Bend National Park discovered a long, hollow fossil bone that was from an enormous azhdarchid wing. Excavations recovered more wing bones, but no body bones could be found. 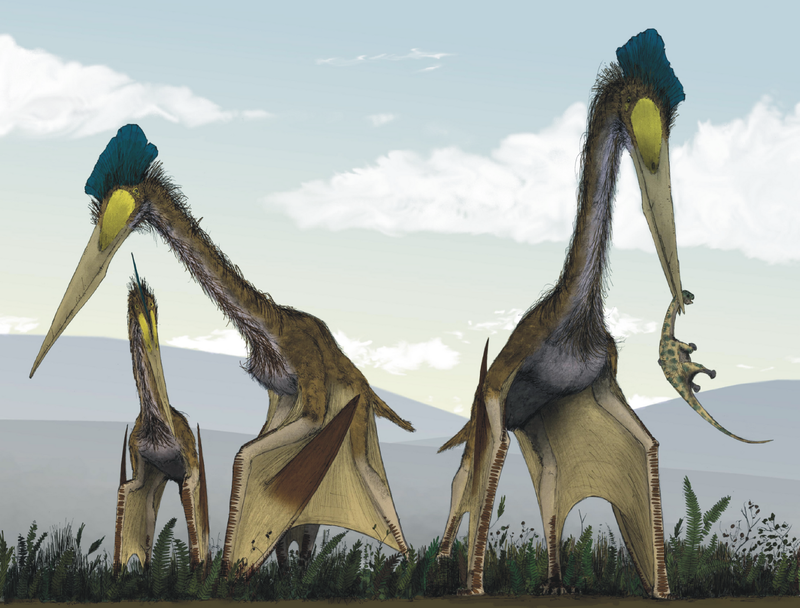 It was named Quetzalcoatlus northropi, after the feathered snake god worshipped by the Aztecs. 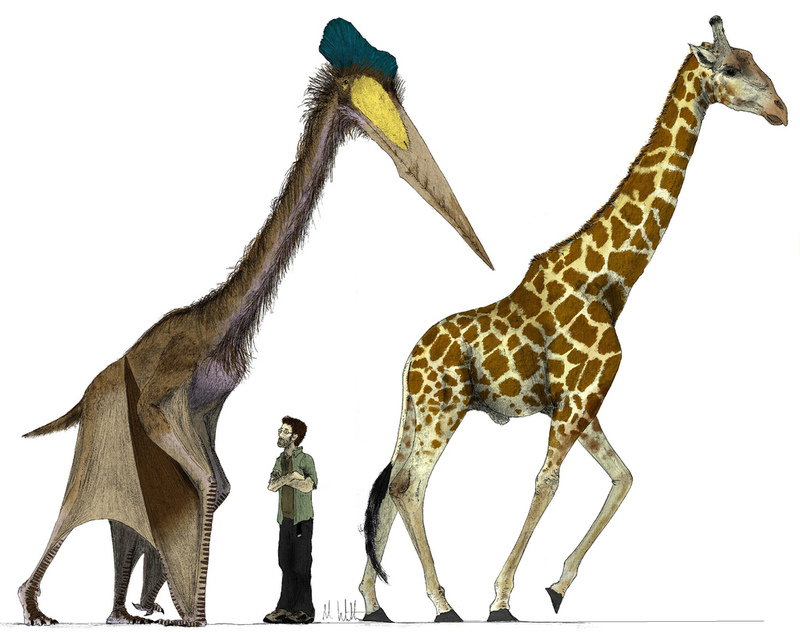 Eventually, other specimens of Quetzalcoatlus were found at the park. These specimens were smaller but more complete than the original, and by comparing them with the massive bones of the original, they were able to calculate the body size of the original specimen. This creature had an estimated wingspan of 10 meters or more and a height of over 5 meters. With a massive, elongate head, long, stiff neck and long hind limbs, this was a real-life dragon (minus the fire-breathing of course!) and the largest flying creature to have ever been found. Despite their huge size, azhdarchids were able to quickly launch themselves into flight from level ground by leaping from all four limbs from a standstill, without the need of cliffs. Azhdarchids were most-likely flap-gliders—capable of short bursts of powered flight while covering long distances by soaring on thermal currents. Azhdarchids have often been portrayed as feeding by grabbing fish as they skimmed the water, but it is more likely that they stalked their prey on land. Their fossils are usually found with terrestrial dinosaurs more typically found in semi-arid inland plains. They were well suited for walking and had feet that were small and padded, better for walking on solid ground rather than wading. They preyed on small dinosaurs and other animals up to the size of a large dog. Like a modern-day stork, an azhdarchid would pick up its prey, toss it to the back of its mouth, and swallow it whole.